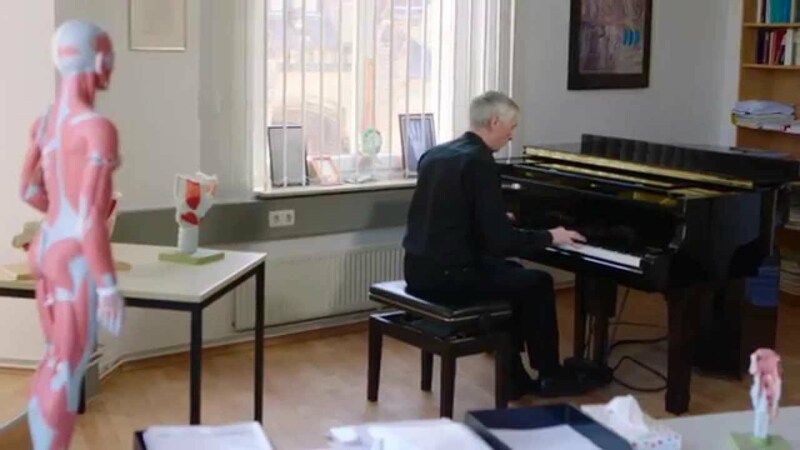 After the Sarah´s Music episode with the MRI experiment, I was excited to combine music and science again – so I went to visit Dr Eckart Altenmüller in Hannover. Dr Altenmüller is one of the top specialists in the world on how the brain perceives and performs music and does incredible work there. Personally, I am a player who has always concentrated on sound and expression rather than thinking too deeply about the brain science behind my playing so I was curious what I would learn. I could have talked to Dr Altenmüller all day about goosebumps and musical brain development but was gently reminded by my team that I had volunteered to be a scientific guinea pig again. We went downstairs to Dr Altenmüller´s lab where his assistant Christos Ioannou was waiting for us with a rather attractive white brain cap. It was all great fun… until they started hooking me up to the computer and squirting stuff into my hair. See the Making Of photos and the outtakes and you’ll understand what I mean… And when the brain cap was removed: OUCH! It was all worth it. It was totally captivating to see exactly what brain activity was going on when I played my horn. It was particularly exciting to watch my brain ‘playing’ Mozart – we could literally see the waves of rhythm happening on the screen in front of us. It was fascinating to talk to Dr Altenmüller – his great passion for his beloved music is very evident – and he had a wonderful way of making even the most technical jargon easy to understand. The best thing to take away from this episode is the scientific evidence that music really IS good for your brain. If children learn music at an early age, they develop better and for older people, music can help with dementia and stroke patients. I have always been a strong advocate of music education and my time with Dr Altenmuller has made me even more convinced that music should be compulsory in all schools. Do you agree? Five Brains- Our Sarah´s Music Team Brain! Removing brain cap 2- OUCH! The Relief to have the brain cap off!